That philosophy is built into MimoCare.. Wearing pendants or push buttons does not always provide that benefit. They are reactive. They may not be worn all the time, forgotten or not charged. But MimoCare is proactive 24/7 and alerts to any issue that needs attention. There are two or three events in the ten stages of ageing that can cause hospitalisation. 1 Falls. Aged 65 or beyond there is a one in three likelihood of a fall. A fall that may mean expensive and uncomfortable stay in hospital. The likelihood of a second such incident is highly possible. A fall is normally a result of a gradual decline in activity. Activity/non activity. Click to expand. MimoCare’s predictive care logs the responses from various battery driven sensors. 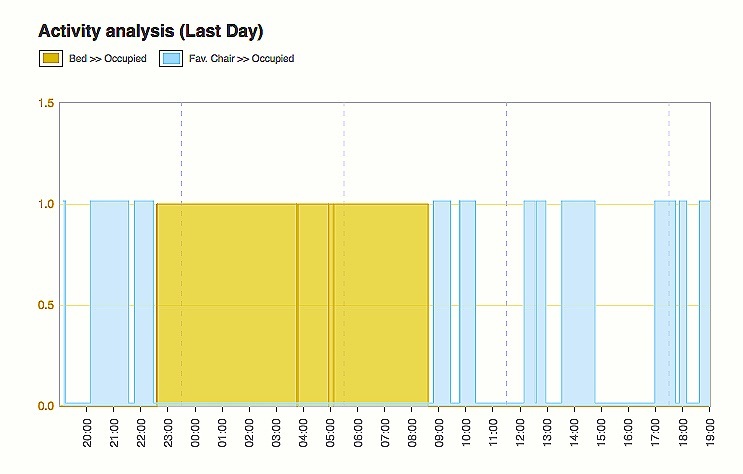 One of them monitors favourite chair usage, another sensor reports bed occupancy. If bed or chair are reporting, then this indicates no activity. If neither are reporting, then this potentially indicates activity (given they are in the room). This information can be displayed as a graph over a period of time. An increasing non-activity trend can notify Carers to engage with the resident early in some planned exercise. 2 UTIs. In the same way, bathroom visits can be logged and once again potentially flag up early UTI infection problems. A MimoCare first. Smart analysis of the collected activity data is able to combine two or more selective alerts. Linked together they can produce a Super Alert. It is an “If this and not that” type analysis. A specific Super Alert that can now continuously check for falls. As things are now, the Elder has to get to a button to report a fall. Nine times out of ten, they are dazed . Even worse they cannot move or can actually be unconscious. Relief maybe hours or sometimes days away depending if somebody notices absence or staff make a morning call. This is a seriously vulnerable area of care for both elder and minder. The Family is a crucial component..
MimoCare monitors 24/7. The day to day routines. Staff are kept abreast of the alerts coming through. Management can also provide access for family if they so wish. Family will also enjoy being able to “see” how Mum is. Whether she has popped out or is using the fridge regularly. It is a visual comfort factor. As technology moves on we can also see integration of private call networks like Alexa enhancing communication and minimising loneliness.